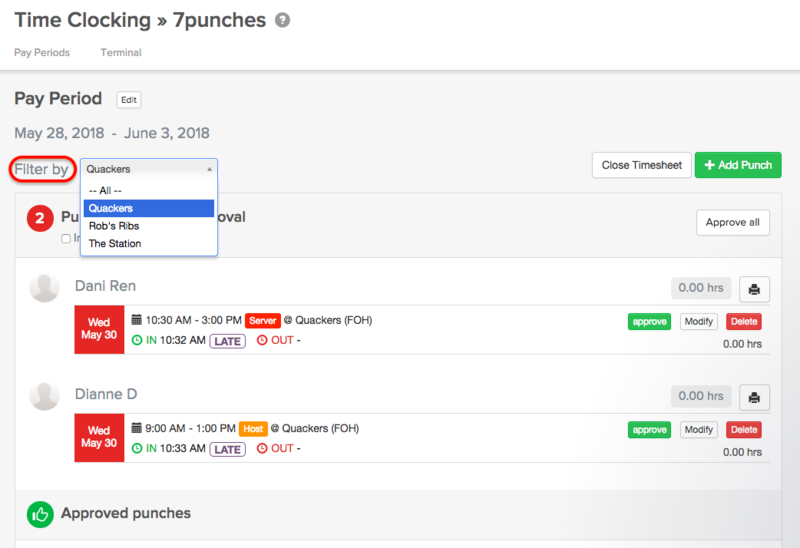 If you are using 7punches for time clocking, you can now export your worked hours in an ADP ready format. This feature is not currently available with ADP Canada. 1. 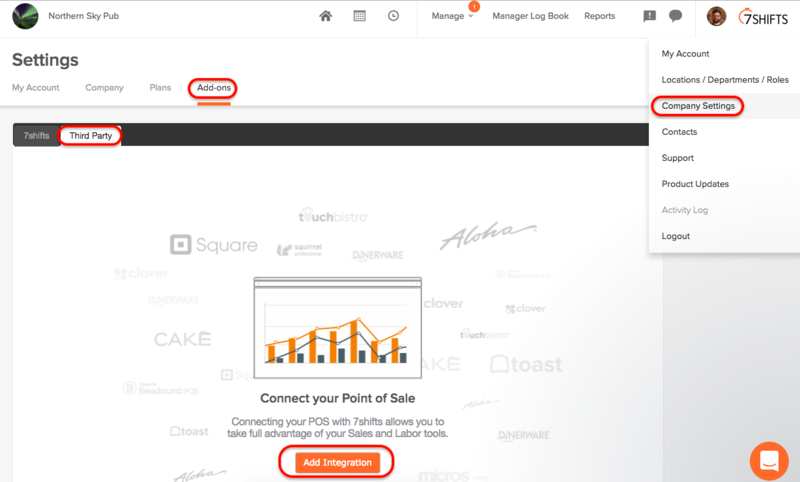 Head to Company Settings > Add-ons > Third Party, then click on 'Add Integration'. 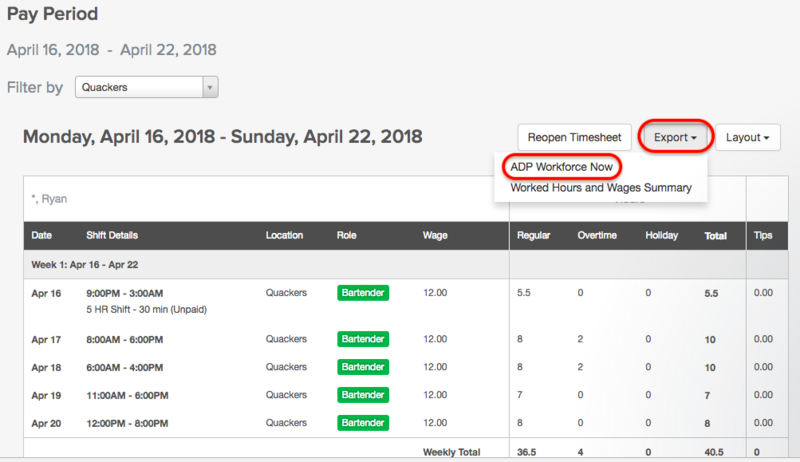 Scroll down and select 'ADP Workforce Now' before clicking 'Add'. This is required and is used for the payroll export's file name. This field is optional and can be used to identify the source of the payroll data in ADP. This field is optional and will only appear you have enabled "Holidays" for this location. If no code is provided, worked holiday hours will be exported as regular hours. Contact your ADP Representative to set this code up. Enable if you would like to export the wages listed in 7shifts for your ADP Paydata Import File. If this is not enabled, the default wage listed in ADP will be used to calculate earnings. Enable if you would like to have tips appear on the export. You'll want to reach out to your ADP rep to set up a custom earnings code which you can use here. 4. 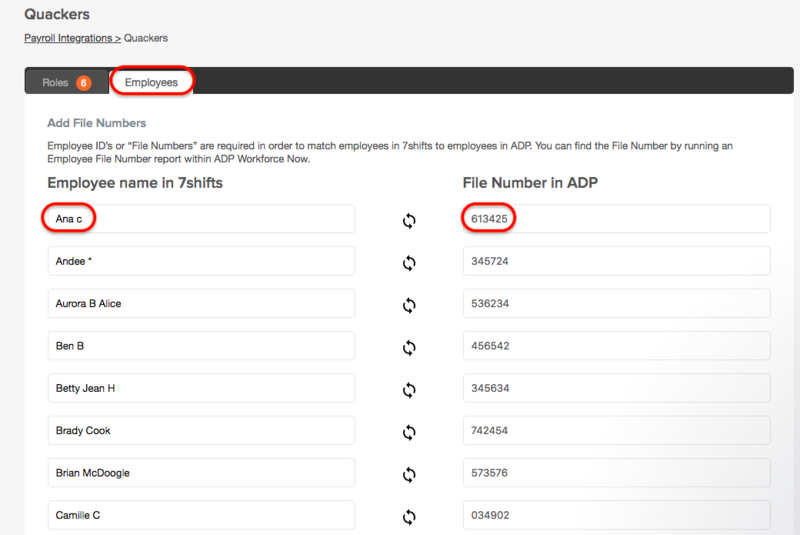 In order to match employees in 7shifts to those in ADP, you will need to input your ADP Files Numbers in 7shifts. If you need help locating the file numbers for employees in ADP, contact your ADP Representative. Click the toggle to the right of 'Department Codes' if you would like to enable those as well. Entering Department Codes ensures that employees get paid the right rate for the work they did. If they are left blank, your employees will be paid their default rates listed in ADP. For each position in 7shifts, set an ADP Department Code. Contact your ADP Representative if you need assistance. Click 'Resolve now' to complete enter the employee IDs or 'File Numbers' and 'Department Codes' (if enabled). 1. Select 'Roles' to enter the corresponding ADP Department Code for each corresponding Role before clicking 'Save'. 2. 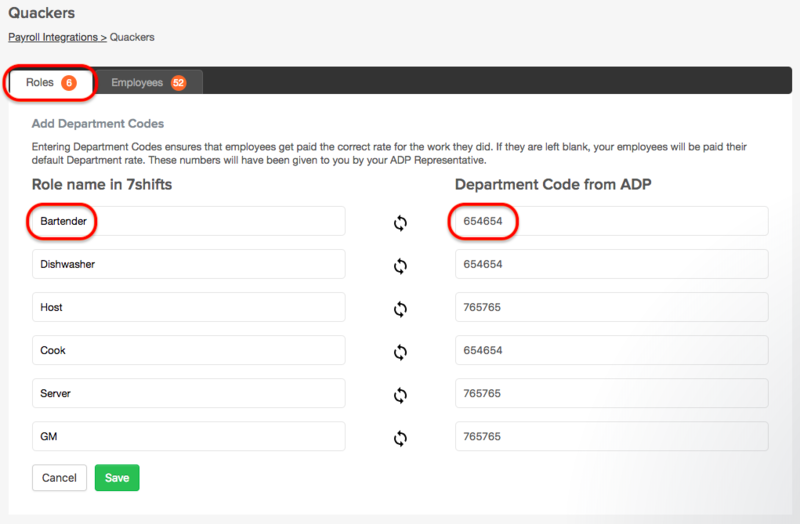 Select 'Employees' to enter the corresponding ADP file number for each employee before clicking 'Save'. 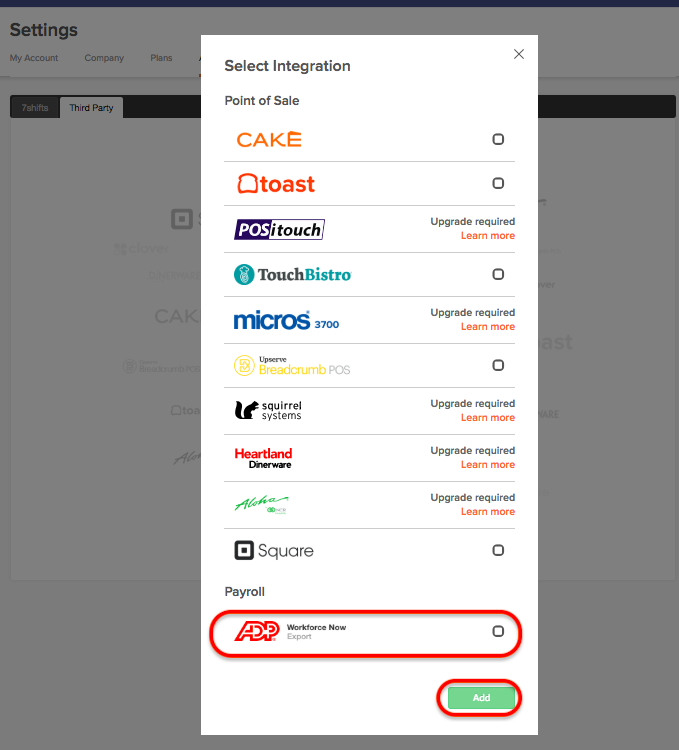 You can come back to this screen to update or edit these codes by selecting Company Settings > Add-ons > Third Party > ADP > Specific Location. Before you can run the ADP Workforce Now payroll export you'll need to ensure that you've properly approved all punches and closed your timesheet. 1. Click the 'clock' icon at the top of the screen, then select the appropriate Pay Period. 2. From there, review and 'Approve' or 'Modify' any and all punches, or choose to 'Approve All'. 3. For multi-Location users, you can also choose to sort by Location, and approve punches by Location. Select 'Filter by' and choose the appropriate Location. 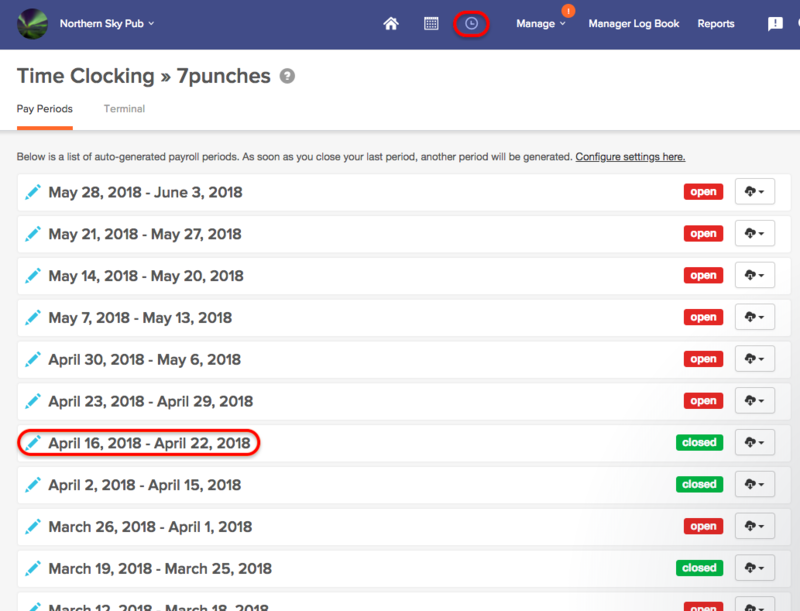 Once you've approved all punches, you're ready to close the Timesheet. 1. 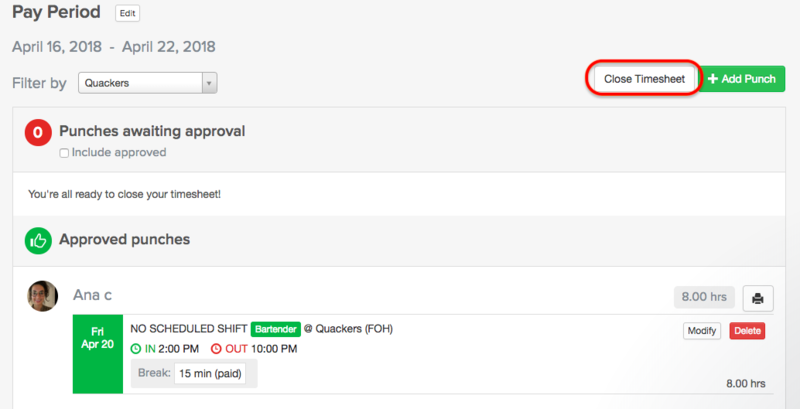 For multi-Location users, you can now close Timesheets on a Location basis. Select 'Filter by' and choose the appropriate Location. 2. To close the Timesheet, select 'Close Timesheet' in the top right corner. 3. You can now export this locations Timesheet by selecting 'Export', then 'ADP Workforce Now'. 4. 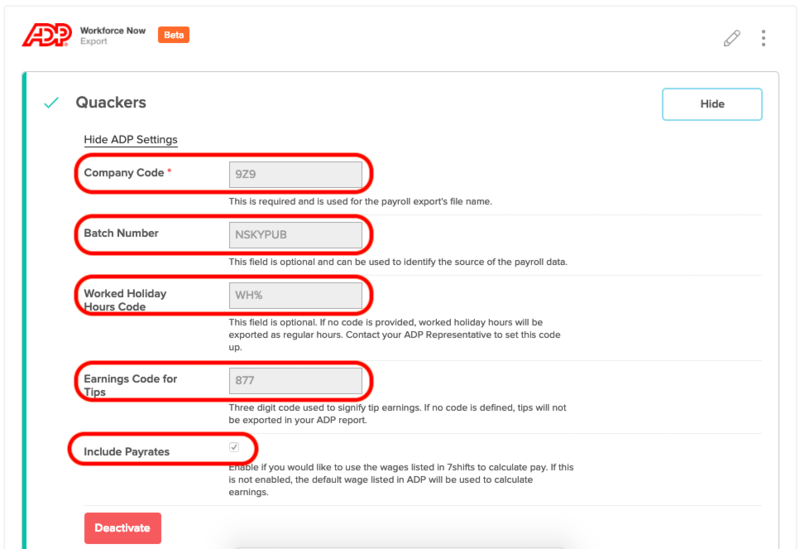 You can now import your payroll data to ADP Workforce Now. Contact your ADP Representative if you have questions about this step.